A spring break is in store for Russia, which will have two shortened work weeks in a row starting from May 1. There’s a spring (no pun intended) in the step of many people in Russia this week. The country witnesses its shortest work week of the year: A grand total of 2 days! This is followed by 5 days off, including the weekend and then a 3-day work week before another 4 days away from work. The May Day festivities kick off the long holiday period. It’s ironic that the people most critical of the ruling regime, that is urban Russians and their brethren in Western Europe, are the biggest beneficiaries of the holidays that have the fingerprints of the president. Many a Muscovite took the two working days off this week and decided to head off on vacation to a European city as cash-strapped cities on the continent eagerly awaited the Russians who tend to spend money like there’s no tomorrow. Europe won’t be complaining about the money flowing in via Russian tourists. I personally know of people who have taken two days off this week and three next week to have a prolonged two-week holiday. One has to wonder how productive these vacationers would be when they finally do get back to office. Are we going to see a situation similar to January when the first ten days of the year are holidays and industrial production crashes along with several essential services? In all fairness, given the toughness of life in the country with long and seemingly endless winters, there’s nothing wrong with a prolonged break but two such breaks, in my humble opinion, creates an atmosphere of laziness. After all, these holidays come in addition to the vacation time that Russians are entitled to in the first place. Those is distant regions have the right to 45 days of paid vacation, excluding these holidays when life comes to a standstill. Like Europe, which unofficially shuts down in the last couple of weeks of August, Russia needs some sort of a similar break and I think May is the right time for it. The cold season is finally on the wane, the birds come back from the south, the grass is green and the days are long. A proper spring break is a good way to recharge the batteries and reenergise before the warm summer months. It might just be easier to get back to work when the days are warmer and there’s the thought of spending time outdoors after office hours without freezing. I may not become popular with these views, but I tend to believe that these May holidays should actually replace the long post-New Year break. Let there be one long set of holidays and let them be a time that when everyone except the most adventurous don’t have to be closeted indoors to keep warm. Of course, it’s highly doubtful that the decision-makers will be reading this column so a lot of my lucky Russian friends and colleagues may just continue to these two sets of long holidays. To hell with productivity! One of my most stark recollections of a long weekend in Russia that was attached to May Day was walking on a pavement laced with glass pieces from broken bottles. Thankfully, no pieces of glass penetrated my made-in-Russia footwear. 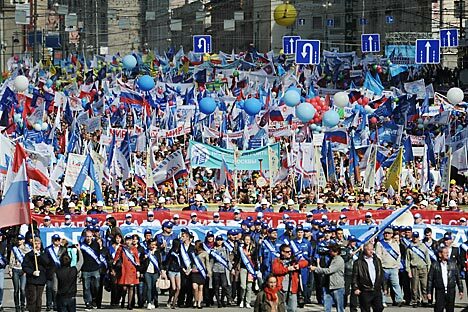 If I did have the choice of celebrating the May holidays anywhere in Russia, my pick would be the Vladivostok, where there are concerts all-day long on the far eastern city’s automobile-free street. The students from the city’s universities know more than a thing or two about having fun and welcoming the warmer months.